Fans of the film In the Loop and the TV series Veep will definitely not want to miss this raucously hilarious political satire from the same creator, Armando Iannucci. This time he has gone back in history to 1953, giving his snappy dialogue to the Russians jostling for control after the Soviet leader’s sudden demise. The setting makes it a lot darker than Iannucci’s previous work, but it’s packed with unforgettable one-liners, visual gags and pointed observations on politics today. In the wake of Stalin’s death, his successors aren’t sure whether they should continue with his campaign of terror against Russian citizens. Dopey deputy Malenkov (Jeffrey Tambor) wants to maintain the status quo, while more progressive Krushchev (Steve Buscemi) is looking for change. Their main rival is Beria (Simon Russell Beale), a thug who likes young girls. Then the enthusiastic General Zhukov (Jason Isaacs) charges in, deciding that they need to push Beria out and go in another direction. 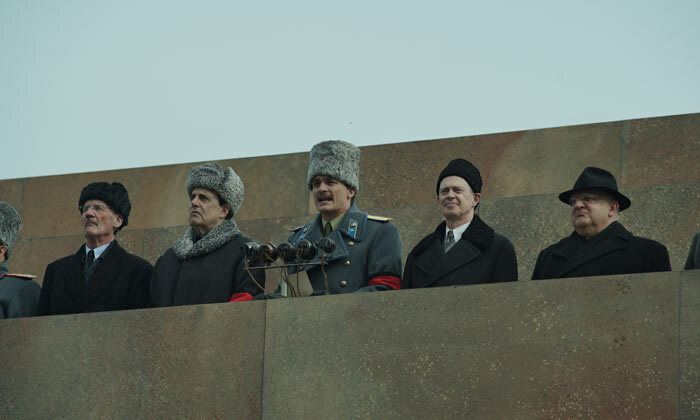 Meanwhile, Stalin’s spoiled children (Rupert Friend and Andrea Riseborough) are determined that they should have a say in any new government, but everyone else knows that their days are numbered. There are quite a few more characters swirling around in these backroom conversations, played by ace actors like Michael Palin, Paddy Considine and Paul Whitehouse, plus Olga Kurylenko as a lofty pianist. Everyone creates a vivid character who indulges in hilarious desperation, knowing that one false move will result in death. Obviously, this is not an easy topic for comedy, and the fact that it’s based on history removes any genuine intrigue, because where it goes is a matter of record. This leaves the plot spinning its wheels, struggling to generate either suspense or surprises. Still, the dialogue is so well-written and played that we never stop laughing at these ridiculous people. The primary scene-chewer here is Isaacs, who effortlessly steals focus as he infuses the film with a sense of mischief. Buscemi, Tambor and Beale are also hilarious as three men plotting how to cling to the last vestiges of their power. And both Friend and Riseborough steal their scenes as brats who indulge in their own forms of self-pity. Iannucci is so good at orchestrating a large cast and dense comedy that it makes no difference that characters are speaking a mix of American, British and weirdly accented English in 1950s Moscow. And as it resonates in a generic “politicians are idiots” kind of way, the humour is so fast and pointed that it keeps us thoroughly entertained. Who Will Direct The Next James Bond Film?